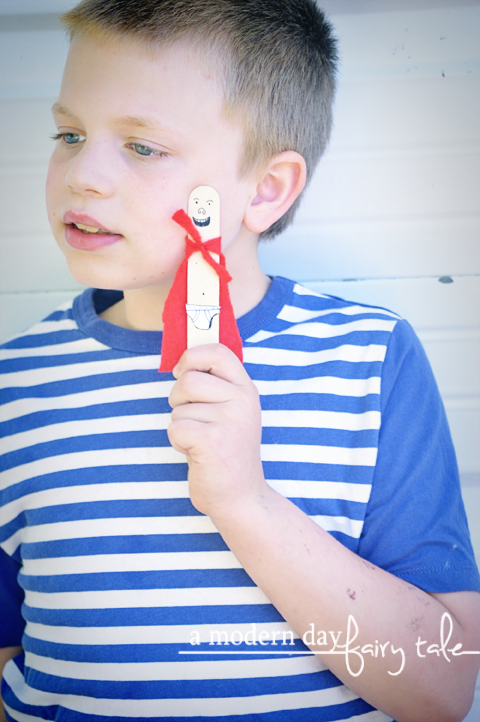 If you have a boy from about the ages of 8-12 or so... there's a good chance you are pretty familiar with Captain Underpants! My son discovered these books a few years ago and has been obsessed ever since. They are his FAVORITE (though Wimpy Kid comes in as a VERY close second). And honestly, who can blame him... they are filled with potty humor, toilets, poop and pranks... all the things that boys his age love. When we heard about the movie... oh, excited doesn't even begin to cover it! He had waited ever so patiently for the weekend to arrive, and we planned a much needed mommy/son date to see the movie in theaters. And in 3D! Yes, toilets and grown man flying around in underwear in 3D...can you imagine? 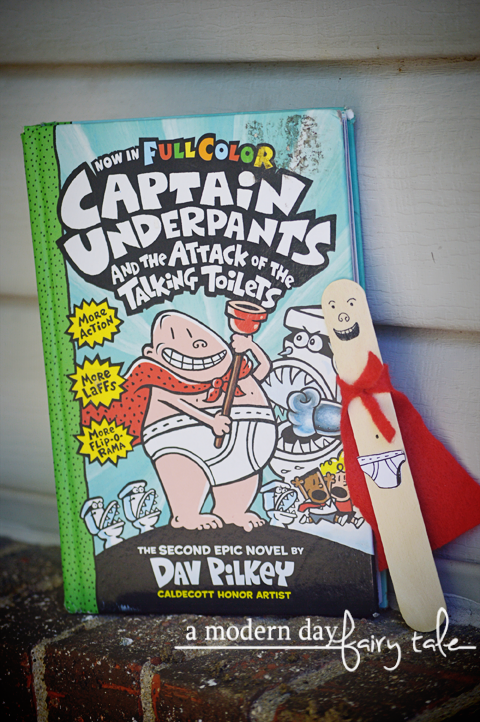 If you have a kiddo who loves the books--- or just a kiddo who loves a good fart joke--- it's worth checking out! Today, we wanted to do a little something fun! If you have a skin toned paint, you can start by painting your stick. We did not have any on hand, so we decided to keep the stick as is. If painting, cover front and back and allow to dry. Next up, prepare your cape. Cut a cape from red felt. Leave extra strips at the top to tie it on. Apply a bit of glue at the tie and in the back to keep your cape in place. If you want to keep this craft a little cheaper, you could also use red construction paper, just cut and glue. Now, create your underwear. Cut the shape from paper and draw on the details. Glue onto your puppet. Finally finish up by drawing on the face and any other details you'd like to include! Tra La La! It is done! Your child will love acting out their favorite scenes or taking their new pal along to the movie! Have you seen the movie or read the books? Are you planning to? Share your thoughts.